Description: Outbound power for the M WCLBAR sits patiently for her train to be built. Photographed at 10:19. Description: BNSF 7403 glides into the siding past a lonely ballast hopper at Lincoln. Description: BNSF Aberdeen, SD to Guernsey, CA loaded grain train G-ABEGUC5-12B rolls westward on the BNSF Hereford Subdivision. BNSF 7403, 4020, 100 loads of LQBYPD DIST MASH,SPT, 0 empties, 13743 tons, 7402 feet, DPU engines BNSF 746 and 4567 on rear. The shipper is Poet Nutrition of Big Stone City, SD and the customer is the Penny Newman Grain Company in Guernsey, CA. Description: The head-end power of BNSF Aberdeen, SD to Guernsey, CA loaded grain train G-ABEGUC5-12B has cut away from its train on Main Track 1 at Black to pick up two additional engines: BNSF 1005 and BNSF 4912. This train was inbound with BNSF 7403, 4020, 100 loads of LQBYPD DIST MASH,SPT, 0 empties, 13743 tons, 7402 feet, DPU engines BNSF 746 and 4567 on rear. The shipper is Poet Nutrition of Big Stone City, SD and the customer is the Penny Newman Grain Company in Guernsey, CA. Description: BNSF Aberdeen, SD to Guernsey, CA loaded grain train G-ABEGUC5-12B accelerates out of Black, TX on the Hereford Subdivision after having picked up two engines. BNSF 7403, 4020, 1005, 4912, 100 loads of LQBYPD DIST MASH,SPT, 0 empties, 13743 tons, 7402 feet, DPU engines BNSF 746 and 4567 on rear. The shipper is Poet Nutrition of Big Stone City, SD and the customer is the Penny Newman Grain Company in Guernsey, CA. Description: West Daggett, 1547 hours. Description: BNSF 7403 leads an intermodal at Joliet, IL Amtrak / Metra station. 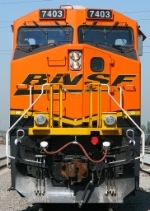 Title: BNSF 7853 Heads a stack train WB. Description: 5521 is just getting a new crew and will pull out, never did see the 7403 leave town. Description: BNSF 7403 - BNSF 2104 - BNSF 5138 power corral under sunny skies, the inspection pit and shed to the left currently empty.